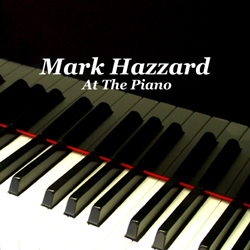 "At The Piano" Is the very first CD that I produced for sale. 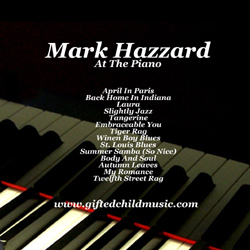 It's initial inspiration was to record a CD that I could send to my mom as a way to say thank you for making me take all those piano lessons. Laura is a song she specifically told me that she liked. The rest are song that I have been inspired to learn along the way. "Slightly Jazz" is an original compostion. It started out with me flailing away on the black keys when I was 17 yrs old. I was thinking this would be a great song. As I thought more about it, the structure started to get developed. The original flailing started out in Gb. To add interest and display some skill, it modulates up to G so I have to play the figure with intention and precision. The original title was "The Non-Conformist." My dad told me if I didn't obay the rules I was a misfit. My music teacher taught me if I could follow the rules then break them, it was creative genius. As the song and I matured a little, I changed the title to "Slightly Jazz" inspired by a band I was once in. I decided to re-record this CD since I had some time to correct some obvious passages that were not my original intention. I look forward to meeting you at sometime in the future.